PokerStars, is the largest online poker cardroom in the world. A PokerStars.com online satellite tournament produced the 2003 World Series of Poker (WSOP) champion, Chris Moneymaker. As the first person to become a world champion by qualifying at an online poker site, Moneymaker's 2003 win was an important factor in catalyzing the poker boom of the mid-2000s. The press has called this the "Moneymaker Effect." PokerStars offers downloadable poker clients for both Windows and Macintosh operating systems. These clients offer users the same features. In January 2012, PokerStars introduced a downloadable mobile client for iOS from iTunes. In February 2012, the company also introduced a client for Android. On July 31, 2012, PokerStars bought its former competitor, Full Tilt Poker. The $731 million deal settled a civil lawsuit with the Department of Justice while giving ownership of Full Tilt Poker's assets to PokerStars. On June 12, 2014, Amaya Gaming Group agreed to buy PokerStars and its parent company for $4.9 billion in cash. The deal was completed on August 1, 2014. PokerStars launched its beta play-money-only site on September 11, 2001. The company began offering real money wagering on December 12, 2001. PokerStars was originally a Costa Rican company, Rational Enterprises, which was majority owned by the Israeli Scheinberg family. The company was subsequently moved to the Isle of Man, a British Crown dependency. The move was driven by the establishment of a 0% corporate tax rate and the removal of rules barring companies from accepting casino and poker bets from the United States of America. PokerStars holds its licence with the Isle of Man Gambling Supervision Commission and also holds government licences in Denmark, France, Belgium, Italy, Estonia and Spain. On February 10, 2012, PokerStars acquired a European Union license granted by the Malta Lotteries and Gaming Commission. While privately owned, PokerStars had been the subject of financial media speculation regarding a possible initial public offering or merger with a publicly listed company. Analysts estimated its market value would have been approximately $2 billion (US) in 2006, which would have made the company one of the world's largest privately held gambling companies. PokerStars overtook PartyPoker as the world's largest online poker room at after the U.S. Congress passed the Unlawful Internet Gambling Enforcement Act of 2006. Many sites, including PartyPoker, immediately suspended business with U.S. gamblers, while others, including PokerStars, did not. On December 27, 2009, PokerStars set the world record for the biggest online tournament. The tournament entry fee was $1, and the number of entrants reached 149,196. They broke that record on December 4, 2011, when 200,000 players played in a $1 buy-in tournament with a first prize of $50,000. PokerStars was so busy during the early stages of the tournament, all tournaments had to be stopped for 20 minutes because the heavy traffic crashed their servers. This record had been broken again at June 16, 2013, with 225,000 participants. The Buy-In was $1 and went completely into the prizepool, with no rake. PokerStars offers the largest number of poker variations: Texas hold 'em, Omaha, Omaha Hi/Lo (8 or Better), Courchevel, Stud, Stud Hi/Lo (8 or Better), Razz, Five-card draw, 2-7 Triple Draw & 2-7 Single Draw, Badugi, HORSE, HOSE, Mixed Hold'em, Mixed Omaha Hi/Lo, Triple Stud and 8-Game Mix. PokerStars also offers "Mixed Games," which rotate through several of these games. PokerStars averages over 15,000 players playing real money cash games daily. The site's weekly Sunday Million tournament has a guaranteed $1 million prize pool and a $215 buy-in. The Sunday Million is the biggest weekly online poker tournament. On March 7, 2011, The 5th Anniversary Sunday Million broke records, with 59,128 players creating a total prize pool of $11,825,600. World Championship of Online Poker (WCOOP) has been running since 2002 and is regarded as the online equivalent of the World Series of Poker. The WCOOP tournament series is the largest online poker series and pays out the largest prizes in online poker. The WCOOP 2010 Main Event champion Tyson “POTTERPOKER” Marks won $2.2 Million, the largest online tournament prize in history. Spring Championship of Online Poker (SCOOP) was established in 2009 and has since become the most popular online tournament series. Unlike WCOOP, there are three different buy-in stakes in the SCOOP events: Low, Medium (10x Low stake) and High (100x Low stake). Micro Millions was launched in March 2012 as a tournament series designed for recreational and micro-stakes players offering a low buy-in tournament schedule and large guaranteed cash prizes. PokerStars guaranteed $5 million in prize pools for the second installment of MicroMillions. PokerStars sponsors various live poker tours such as the European Poker Tour (EPT), Asia Pacific Poker Tour (APPT), Latin American Poker Tour (LAPT), UK and Ireland Poker Tour (UKIPT), Estrellas Poker Tour (ESPT), Eureka Poker Tour, Italian Poker Tour (IPT), Czech-Slovak Poker Tour (CSPT), Australia & New Zealand Poker Tour (ANZPT), France Poker Series (FPS), Belgian Poker Series (BPS), Russian Poker Series (RPS) and Brazilian Series of Poker (BSOP). PokerStars also sponsors the PokerStars Caribbean Adventure (PCA). Since it started in 2004 the PCA has grown into the biggest poker event outside of Las Vegas. Pokerstars.net is a company website offering free play but no real money games. PokerStars.tv is the online source for PokerStars TV shows, commercials and event highlight shows - with commentary and expert analysis available in up to 7 languages. The content available includes live cards-up coverage of the biggest PokerStars tournaments, TV shows such as The Million Dollar Challenge and PokerStars Big Game and online tournament highlights from WCOOP and SCOOP. PokerStars sponsors a team of professional players known as Team PokerStars Pro. The team includes Chris Moneymaker, Daniel Negreanu, Liv Boeree, Jake Cody, Bertrand Grospellier, Barry Greenstein, Jason Mercier, Vanessa Selbst, Luca Pagano, Victor Ramdin, Andre Akkari, Eugene Katchalov, Johnny Lodden, Leo Fernandez, Ivan Demidov, Theo Jørgensen, Lex Veldhuis, Dag Palovic, Jason Somerville, Randy Lew. PokerStars also has a Celebrity team and a Sports team, called respectively "Friends of PokerStars" and "SportStars". These include Tennis Pro Rafael Nadal, former tennis champion Boris Becker, Dutch field hockey Olympic Gold medalist Fatima Moreira de Melo, Norwegian cross-country skier Petter Northug, Swedish cross-country skier Marcus Hellner, FIFA World Cup-winning Italian goalkeeper Gianluigi Buffon, former footballer Ronaldo, quantitative analyst and author of the 'Chen Formula' for Texas Hold'em Bill Chen, Brazilian auto racer and race team owner Gualter Salles and French rugby union international Sébastien Chabal. PokerStars.com and PokerStars.eu operate worldwide under licenses from the Isle of Man and Malta governments, respectively. PokerStars also operates under separate government licenses in Denmark, France, Italy, Belgium, Spain and Estonia. In October 2008, PokerStars launched PokerStars.it, exclusively for Italian players, which offers real money tournaments in euros in addition to the usual play money games. PokerStars offers some ring games and tournaments on its main PokerStars.com site in euros. In March 2010, the site began allowing users to keep their real-money accounts in British pounds and Canadian dollars as well as U.S. dollars and euros. United States Department of Justice website seizure noticeOnline poker was suspended on April 15 at the top three United States websites (In order, PokerStars, Full Tilt Poker and Cereus Poker Network) and continues to be suspended at the top two. 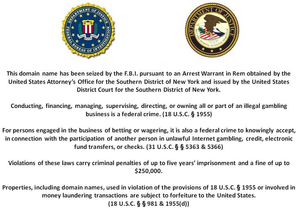 On April 15, 2011, the Department of Justice seized the .com internet addresses of the three online gambling sites, a total of five URLs: Pokerstars.com, Fulltiltpoker.com, Absolutepoker.com, Ultimatebet.com and UB.com. On April 15, 2011, the U.S. Attorney's Office for the Southern District of New York seized and shut down Pokerstars.com and several of its competitors' sites, alleging that the sites were violating federal bank fraud and money laundering laws. On April 20, 2011, the U.S. Attorney's office returned control of the Pokerstars.com domain name to the company in order "to facilitate the withdrawal of U.S. players’ funds held in account with the companies." On July 10, 2012, PokerStars, asserting the Government had insufficient grounds on which to base the charges, filed motions to dismiss the charges against them. On July 31, 2012, the US government dismissed with prejudice all civil complaints against PokerStars and Full Tilt Poker after reaching a settlement with PokerStars which includes PokerStars purchasing Full Tilt. Under the terms of the settlement, PokerStars and Full Tilt Poker admitted no wrongdoing for their past U.S. activities. The U.S. Government acknowledged both companies can apply for licenses to operate online gaming in the U.S. when a legal framework for such licenses is offered. The settlement terms also called for PokerStars to acquire certain assets of Full Tilt Poker from the Government. On August 9, 2012, PokerStars paid $225 million to the U.S. Department of Justice, consummating the asset transfer of Full Tilt Poker. Full Tilt Poker was successfully relaunched on November 6, 2012.